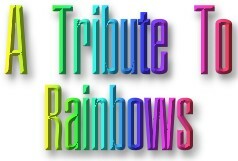 This is just a little tribute to Rainbows. I have wanted to do it for a very long time but I thought it a little frivolous. Then I thought...What the hey!